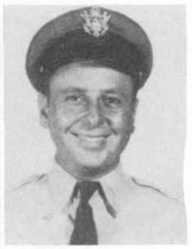 H e was a 1st Lieutenant in the 45th Tactical Reconnaissance Squadron. He flew a F-51D Mustang during his missions. From what I’m told (and have read in various places on the internet), these planes would fly low over hostile territory and take photos of the enemy. And of course, these were the old fashioned film cameras, not the new fangled digital ones. An important and dangerous task to say the least. Then again, every task during war time is important and dangerous. It was during one of these missions in mid 1951 when he was providing air cover for rescue of a downed helicopter pilot that his plane was shot down over North Korea. According to TogetherWeServed.com, “his wingman observed his Mustang catch fire and crash and no parachute was seen.” He was posthumously awarded the Distinguished Flying Cross, Purple Heart, and Air Medal. 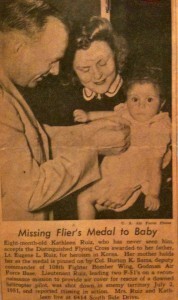 You can see his 8 month old daughter in the photo to the left accepting the Distinguished Flying Cross while her mother holds her. On this day, let us also acknowledge the families who live on after their loved ones have given their lives in the name of our country.